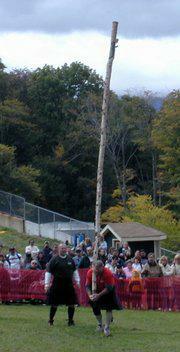 When you hear the term Highland Games, what springs to mind? Tossing the caber perhaps, or massed pipe bands marching and the sound of bagpipes filling the air, making the hair on the back of your neck stand up. Well whatever images come to mind, no trip to Scotland would be complete without a visit to at least one of the games. It should be noted of course that these events are by no means exclusive to Scotland. Since the early eighteenth century the Scots have been emigrating to almost every corner of the world, taking with them their Celtic culture and traditions. And in particular their Highland culture, which is one reason that you will find more games taking place every year in America and Canada than you find in Scotland. A very good example is Bill Baxter who lives in Florida, his father Robert sent me the photo below. So where does the history of these games begin? The origins are not well documented, but it is thought that the clansmen would use these events as a form of training for war, as during various times of occupation by the English it was forbidden in Scotland to bear or train with arms. So they simply trained with the events that we see in today's games. The games as we know them were made popular in the Victorian era, around the same time as they introduced tartans to the clans. 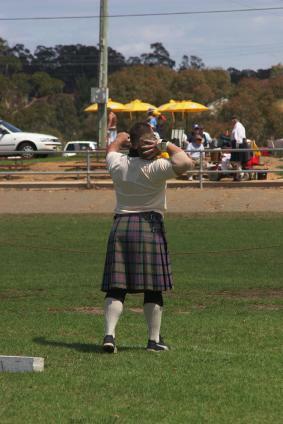 So what can you expect to see at the Highland Games? Well in keeping with tradition you have the heavy events, the most famous being tossing the caber, a photo of which you can see below. Other events include the stone putt, the Scottish hammer throw, the weight throw, the weight over the bar, the sheaf toss and the tug of war. Below you have a photo of a Scottish athlete about to putt the stone. Music also plays a major part in any games, you will often see twenty or more pipe bands marching and playing together, at the opening and closing ceremonies, and this is often the highlight for many of the visitors. These bands of course are competing with each other, both in drumming and piping competitions during the games. But they are not the only forms of music to be heard, fiddling, harp and Celtic bands are regular attractions at many gatherings. 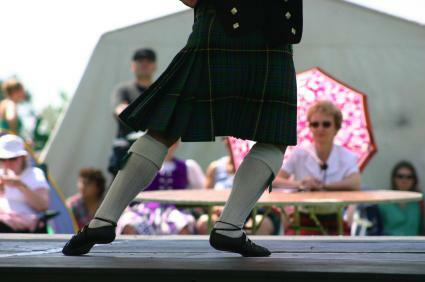 Dancing is also very popular, both Scottish country dancing, and the highly competitive Highland dancing. Below you can see a dancer in competition. The most famous dances include the Sword dance, the Highland fling and the reel. These dances are very technical, and require many hours of training and take several years to perfect. They have more similarities with ballet, than the more social dancing of the Scottish Country Dance. The various clans are also very evident at these events, as you would expect. And they offer you a great chance to find out about their membership and activities, and whether you are eligible to join if you wish. At most of these events they also have a pre- event ceilidh, which is a traditional Celtic party with dancing traditional music and usually a fair amount of Scotch Whisky. One other thing, you will also get the chance to see more kilts being worn than at almost any other time. So as you can see there is something for everyone, and it would be a great pity if you didn't put it on your list of things to do the next time you visit Scotland during the summer months. Or indeed America, or Canada, or Australia, or New Zealand and many other parts of the world, where these games take place.